Leading Saudi Arabian pastry chef, Mayada Badr and counterpart Waddah Bou Saad, originally from Syria and now based in Dubai, have had recipes using the finest French cream published in exclusive dessert recipe book. Chef MAYADA BADR, from Saudi Arabia, first studied design before pursuing her passion and enrolling at the Cordon Bleu in Paris. After she returned to Jeddah in Saudi Arabia, she went on to open her own pâtisserie: Pink Camel. She is commonly known as the Macaroon Queen. How important do you think cream is in pastry-making? Cream is extremely important in my cooking: it gives my pastries a certain lightness, puffs them up and gives them a soft texture. This sensation of lightness is crucial for me, and cream is the ingredient that truly helps me create the right feel. How do you process and use cream? in on a little trick I use! I use lots of cream to make my macaroons lighter and tastier. Honestly speaking, you just have to use cream for a scrumptious pastry! What does cream remind you of? ingredient that can take a dessert to the next level and bring out its flavours. What is your favourite cream cake?/Which of your creations best highlights the role of cream? I think my prettiest cream pastry is the one I have made for this book. I call it “Al Huda” meaning “Serenity”, but it is also named after my aunt who was a terrific cook! It is a vacherin with the creaminess of ice-cream, surrounding a soft gooey centre of coffee and cardamom, covered by a rose meringue. It is a light and creamy dessert that you just can’t put down once you have begun! Any advice about how to use/handle cream for your peers? You need to be quite careful while working with cream. Don’t heat it for too long. Chef WADDAH BOU SAAD, from Syria, is extremely passionate about pastries. He especially loves working with chocolate and his speciality is eclairs. 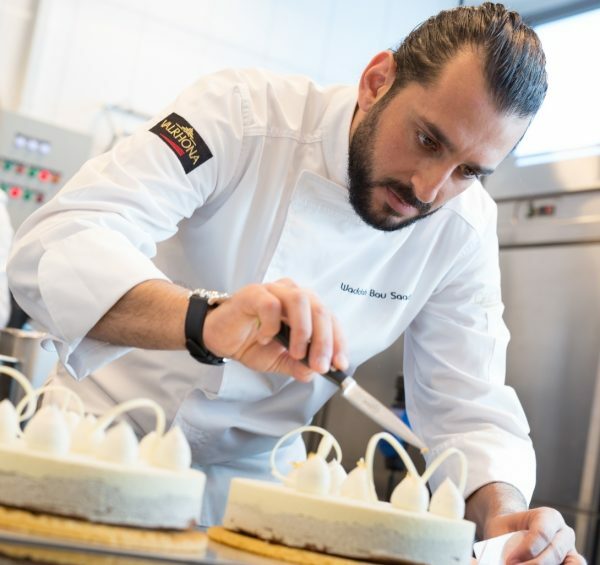 He worked as a pastry chef at La Serre Bistro & Boulangerie, one of the most renowned pâtisseries in Dubai, before joining Lighthouse, a new concept store. How important is cream in your pastry-making? Cream has always been an essential element in my cooking. It is an extremely special ingredient that I use in all my pastries. It adds lightness to my desserts, gives them a rich texture and a unique taste, and gives my creations the perfect balance. I think pastry chefs are also artists, and cream allows us to express our creativity! I whip my cream by hand, and I like doing this because I have found that I can control it better than a mixer. Though this does take longer, I am so thrilled with the end result that it’s certainly worth the effort! You can feel that the cream is indeed lighter! I usually use cold cream for all my preparations, but sometimes I infuse it (at 45-50 degrees) with herbs like basil and mint or Tonka beans. I also find that cream goes perfectly with certain local ingredients like cardamom. Generally, you won’t be able to see the cream in my desserts unlike the Chantilly cream, but there is no missing it when you taste it. Cream for me is lightness and softness. What is your favourite cream cake? Which of your creations best highlights the role of cream? When it comes to my favourite cakes, I love cheesecakes, especially those with passion fruit. I also love eclairs. The softness of the pastry cream contrasts with the power of the icing, which is always a lovely surprise. Sometimes, it is the simplest things that leave the most profound impact. I created the White Forest as an ode to cream: it is an immaculate white and perfectly balanced round pastry with a refined elegance. Cream is a delicate ingredient. It is very important to be careful while working with it to create that perfect texture. You have to understand the cream well to get the most out of it. Interview with Lata Menon, regional sales manager for KMC.